Opportunity knocks: Apply for a Summer STEP-UP Internship! Lowry Avenue Community Works is a collaboration between Hennepin County Public Works and the City of Minneapolis to improve transportation options, offer housing choices and support business growth in the Lowry Avenue communities. 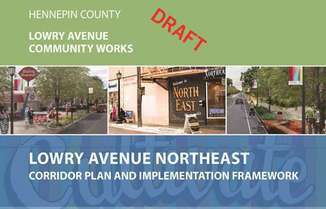 The final report on our planning efforts - the Lowry Avenue Northeast corridor plan and implementation framework - is currently being reviewed by the technical staff and elected officials at the Minneapolis City Council and Hennepin County Board of Commissioners. We anticipate that it will be available to the public by mid-March. Once the board and the council have considered the plan, they may decide to dedicate funding for the project. Currently, funding is not in place for redevelopment or road improvement activities. It's not too early to think about summer plans! Get in with STEP-UP and join other Minneapolis youth for summer internships that will help you expand your job skills, make professional connections and expose you to a range of career options. Applications are due February 18.
Review the income guidelines and get more information with the online application. Applicants will hear in early March if they have been accepted. Before starting an internship, those accepted to the program will attend work-readiness training to enhance skills and prepare for a professional work experience. This training is certified by the Minneapolis Regional Chamber of Commerce. Learn more about STEP-UP at the City of Minneapolis website: www.minneapolismn.gov. 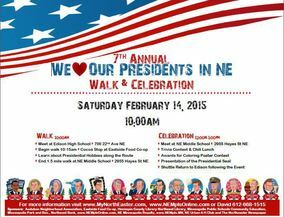 Join neighbors and friends on Saturday, Feb. 14, for the Seventh Annual Presidents’ Day Walk and celebrate American leaders - and one of Northeast Minneapolis' most distinguishing features. Stroll the streets named after presidents during this family-friendly event, which includes anecdotes about presidential hobbies and other fun facts. The gathering convenes at 10 a.m. at Edison High School, 700 22nd Ave. NE, with a step off at 10:15 a.m. The 1.5 mile walk includes a warm-up-and-cocoa stop at the Eastside Food Coop and culminates with a chili lunch at Northeast Middle School, 2955 Hayes St. NE. A trivia contest and other activities accompany lunch, so pay attention during the walk for hints! A shuttle is available for the return to Edison High School following the event. For more information visit www.MyNortheaster.com and www.nemplsonline.com. Remove all ice from sidewalks. After the sidewalk is cleared, sprinkling a little sand can help prevent slipping on frosty sidewalks. Free sand for sidewalks is available for Minneapolis residents. Pile snow into your yard and boulevard. It’s illegal to put snow into streets and alleys. If you have a corner property, clear curb cuts at corners and crosswalks to the street gutter. You are not required to clear snow ridges or piles left by the plows beyond the gutter. City crews will make an effort to return to do this work as quickly as possible, but with some 20,000 corners to clear across the City, it may take a while. For more information, call 311 or visit www.minneapolismn.gov.